Asymmetric Key Encryption/Decryption using Keytool. This blog explains how to create keystores, certificates and trustore. It also explains how the handshaking is done between to parties who wan to communicate securely using asymmetric key Encryption/Decryption. Below video explains secured message passing communication using asymmetric key system. For asymmetric encryption/decryption both parties need to crate asymmetric keys which has both private and public key. Then the public key is exported from he keystore and given to the other party. The other party then imports the public key(certificate) into a truststore and used that truststore to encrypt the data. Remember a public key(certificate) can be used to only encrypt data. The data can be only decypted by the private key. Below commands generate Keystores, Certificate, Trustore for both parties. Both Parties, yes, because this is a bi-directional assymetric key that means both the parties have their set of key-pairs. We have now extracted the public key from their respective key pairs. This certificates can then be added to other parties truststores. Trust stores are a bucket of Open Pad locks. So now we have trust stores which have public key of other party. Lets write the code to use these keystores and trusstores. For a maven project you will need the apache-common-codec jar as a dependency or else just download the jar and paste it in the folder which is in the classpath. //Client encrypts data by using server public key which is stored in clients trusstore. 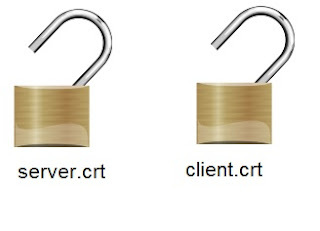 //Server encrypts data by using clients public key which is stored in servers trusstore.